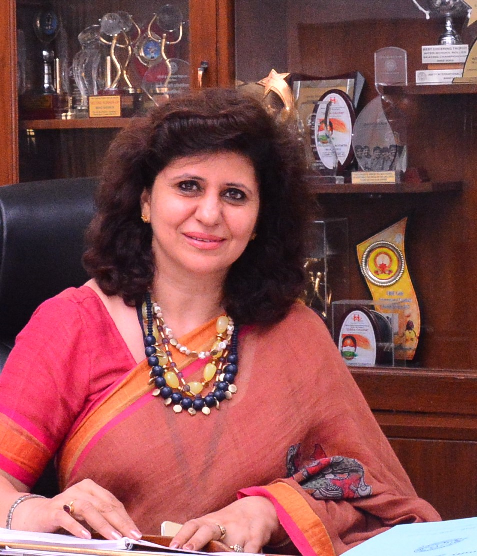 Ms. Arti Chopra (https://www.linkedin.com/in/arti-chopra-90914a46/) Ms. Arti Chopra, a dedicated Educationist with over 28 years of experience in the field of education as a teacher, mentor, trainer, planner, skill developer, and a tireless worker for the cause of children is a firm exponent of amalgamating modern skills and teacher empowerment in education. She is an alumnus of Lady Shri Ram College, Delhi University, and has had been associated with leading institutions like Bal Bharti Public School, Delhi; Sawai Man Singh Vidyalaya, Jaipur and Lawrence School, Ooty in her sparkling career. Her repertoire also includes Master’s Degree in Business Administration from Amity University, in Economics from PU and in Education from MDU. Besides her teaching experience of 15 years in the field of education, MS Arti Chopra has administrative experience of 13 years as Principal in promising schools like Sunbeam School, Varanasi, Indraprastha International School, Dwarka, New Delhi and presently at Amity International School, Sector 46, Gurgaon British Council ISA 2014-17 has recognized her for leading the Integration of International Learning in the school. She has been decorated by SGT University with EXCELLENCE AWARD for bringing about excellence in academics and overall institutional development in NCR and Inspiring Educator Award by Outdoor Education Research Team of Great Rocksport Pvt. Ltd for all-round development of school children. She was also conferred with Outstanding Educator Award by Ansal University, Gurgaon, in recognition of being a torchbearer for National School Cyber Safety Campaign. As an Innovative Educator, she has been conferred with Group Challenge Class Hack Award by Microsoft at E2 Educator Exchange conference held at Hungary for displaying excellence in problem-solving with the help of technology. She led the congregation of students as MUN director in Budapest International Model United Nations, Hungary and was an eminent member of Jury for the Tournament of Champions at The World Scholar Cup, Yale University, US. She spearheaded the EU lead Future Young Entrepreneurs program at Berlin, helping students attain the first position on the International platform. She pioneered the setting up of Varanasi Sahodaya School Complex in Varanasi, and led the group for 3 years as Convener and is the acting Secretary of Gurgaon Progressive School Council. She has written in journals, presented papers and led panel discussions on a variety of occasions, some of them being Futuristic Teaching Practices at the National Conference on Emerging Best Practices in CBSE schools, Teaching-learning processes at AIE, Saket, Future of Learning Forum organized by The Economic Times. and Multiple Intelligences at the Leadership Summit organized by CBSE Lucknow Sahodaya School Complex. She was felicitated as a speaker on ICT in the 23rd National Annual Sahodaya Conference for Principals on skill development held at Raipur.